As you weave your way through our World of Illusions, remember one important rule: nothing here is what it seems. Venture into five floors full of things you’ve probably never seen before. A swirling light vortex that can sweep you off your feet. A maze made of mirrors. A chance to swap noses with a friend. It’s all here. There are over 100 illusions, so you’ll need at least two hours to discover them all. The minutes will pass so fast you’ll think it’s another one of our illusions. It’s not. Time just flies when you’re having fun! Magic Gallery – from classic illusions to electrifying experiments, everything here will blow your mind. Light Fantastic – see yourself grow, shrink and stretch. This’ll mess with your mind – in the best possible way. Gaze in wonder at our pictures and see how your eyes can be fooled with brilliant visual effects. Eye Spy Edinburgh – think you’ve seen Edinburgh from every angle? Think again. Same city. Different vantage point. Discover Victorian and 3D cityscapes alongside our View Cams, powerful modern cameras showcasing the city in real time. Bewilderworld – immerse yourself in wonder, when you step right into our biggest illusions. Top tip: save this most mind-blowing experience for last. Our Magic Gallery is situated on the fifth floor. Discover our most electrifying exhibits along side more traditional, classic illusions. 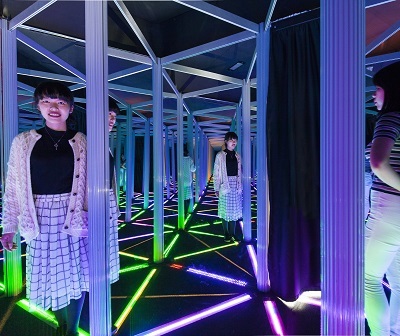 The Light Fantastic is situated on the fourth floor. Gaze in wonder at our stunning holograms and 3D pictures. See how your eyes can be fooled with brilliant visual effects. 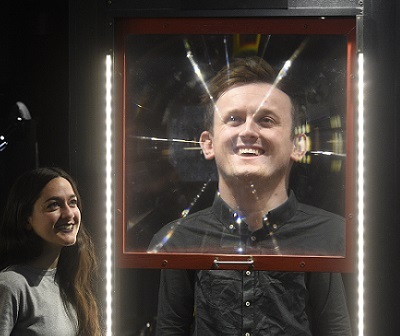 On the third floor is Eye Spy Edinburgh, an interactive gallery where you can use cameras and mirrors to view the world around you in a new way. Here you can find our biggest and most popular illusions. Find Bewilderworld through the glass corridor on the second floor.